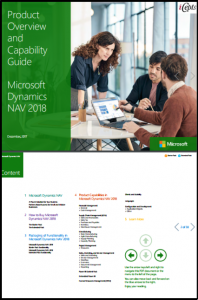 Microsoft Dynamics NAV delivers a unique combination of business intelligence, collaboration and communication tools that drive productivity, improve profitability and support your business as it grows. Used by over 120,000 companies world wide, Dynamics NAV has the rich functionality to meet your business goals and ambitions. Moving to a new business management system might seem overwhelming, but Microsoft Dynamics NAV simplifies the process with a solution and deployment options that are designed to get you up and running in days rather than weeks—and without expensive development or increased manpower. Deploy on-premises, or as a partner-hosted cloud solution, or a combination of both that reduces your up-front investment. Our ongoing commitment to innovation means you are investing in a business solution from Microsoft that will help you get ahead and stay ahead.